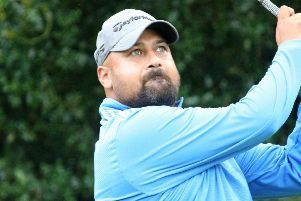 FIRST there was Neil Raymond, a two-time Brabazon Trophy winner, followed by Hampshire’s first-ever home-grown British Amateur champion Scott Gregory. 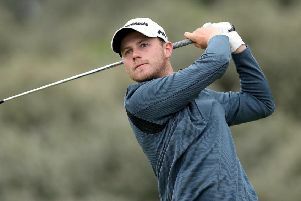 Now Jamie Markwick is setting out his stall to become the latest Corhampton golfer to make his name on the big stage. Markwick's victory might not have come in an ideal manner. Torrential rain after a thunderstorm forced organisers to suspend play for several hours. And Markwick, who had already posted the best round of the day with a 71, was forced to wait until the players who had not completed their first rounds were able to get back out so the competition could finally be settled over 18 holes. He said: 'Obviously, it is not ideal to win a tournament shortened because of the weather. 'Ask any player who plays at this sort of level and you want to win the trophy by beating everyone fair and square – and with the conditions pretty much the same for everyone. 'But looking back already, that situation created its own pressures and challenges, particularly mentally, having to sit around knowing I had the best score in, and then waiting to find out if the one player who could theoretically catch me, could finish it off. 'At one point he was left needing something ridiculous like two, two, two, over three holes to beat me, but they could not say it was done until it was completely mathematically impossible. 'I had to be ready in case he tied me as they might have held a play-off if there was no more rain. 'At the end of the day, it does not say 18 holes-only on the trophy and it is a great championship to have got my name on the winner’s board at such a great place like Moor Park. 'Further down the road, the kind of things that go through your head in that situation – wondering if you have won, or if you are going to have to go out to play – will have been a good experience to have under my belt this early in my career.